WASH project visit, by the outreach team at Lalgadh Leprosy Hospital, to Sinoorjhoda village on 10th April 2016. 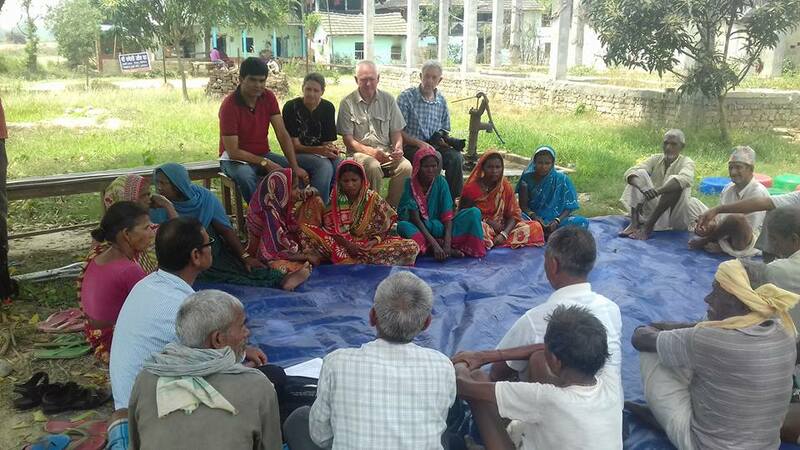 RECLAIM Project Evaluation Team at Bhaktipur Self Help Group, Sarlahi district. 6th April 2016. 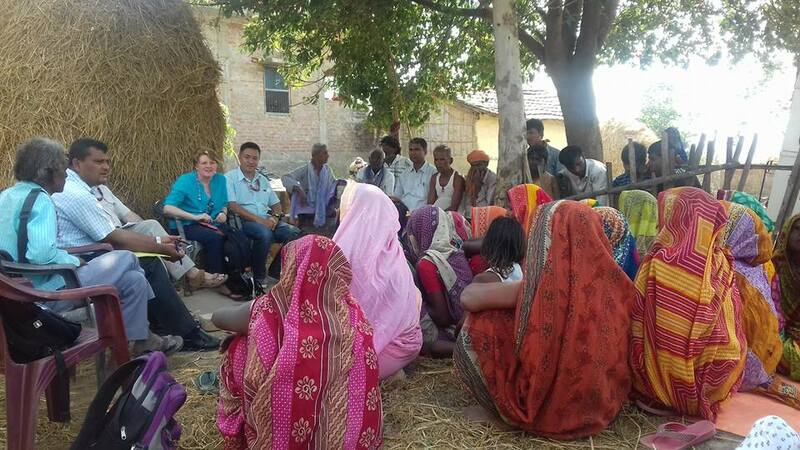 Our community outreach team from Lalgadh Leprosy Hospital Services Centre make regular visits to the rural villages to review and evaluate the ongoing projects. These meetings usually take place in the shade of a large tree which is often positioned in the centre of the village. Congratulations to our very own Dr Graeme Clugston, Medical Director at Lalgadh Leprosy Hospital, Nepal. In the Australia Day Honours 2016 under the Order of Australia, Officer (AO) in the General Division. Dr Graeme, smiling, as always. ‘The Australia Day 2016 honours list recognises more than 800 Australians across a wide range of professions and industries, from all states and territories. Often, the best thing about the awards is the way they shine a spotlight on those who quietly do remarkable things to assist others. Dr Graeme Clugston is a great example. Clugston is the Medical Director at the very busy Lalgadh Leprosy Hospital in southern Nepal. The hospital where he works is one of the world’s busiest leprosy hospitals’. RN Breakfast. Listen to a podcast of Dr Graeme’s interview with Fran Kelly on RN Breakfast. We got great news this morning 12th December 2015: our hospital in Nepal have received some diesel fuel and are already on the road delivering much needed earthquake relief aid again. See more below. Basheswar school, Class 1, Dec. 2015. Basheswa temporary school for Class 5, with the teacher. ‘The strike, political violence and blockages have tragically prevented most relief work in Nepal for the last 3 months. Now the Himalayan winter is here – it’s cold and getting colder. Yesterday (Thursday 10 Dec), by some extraordinary means, we got some diesel-fuel – enabling us to resume urgent earthquake relief work. The fuel enabled us to go yesterday up over the Sindhuli mountains to (a) visit some earthquake affected schools we’ve been waiting/wanting to assist, and (b) deliver 800 blankets to 2 very poor earthquake-devastated communities. Facts: – remember? – the massive earthquakes earlier this year … wrecked most of Nepal’s schools – 48,000 classrooms destroyed or damaged, 20,000 classrooms requiring demolition and reconstruction, 999,000 students out of school, another 440,000 students affected adversely …that was the immediate impact of the earthquakes in April, May and the subsequent 408 aftershocks up till today (24 November)’. Thank you to Dr Graeme for the update and for the lovely photos. Well done and safe travelling. Thank you to our wonderful donors who have enabled us to receive €2,505 in tax back for 2014 from their generous donations to Nepal Leprosy Trust (NLT) Ireland. As a registered charity NLT is able to claim the tax back from the government on all individual donations which exceed €250 in a year. As a donor you simply need to return a form giving us permission to claim the tax back for your donations. €2,505 received in tax back for 2014, on your donations. Thank you. Delivery of 36 tons of rice, lentils, oil, salt, blanket, and tarpaulins. Don’t forget Nepal – many thousands still need food and shelter. As the world’s attention has sadly moved away from Nepal and its massive earthquake disaster 3 months ago, there are still hundred’s of thousands still in need of basic food, blankets, tarpaulins and shelter-building materials. Relief has still not reached many remote communities. They need this help to survive through the current monsoon with its rainfall and landslides, and then the cold Himalayan winter in the coming months. 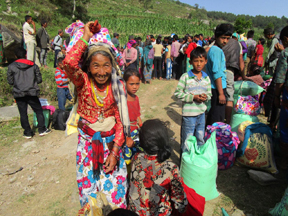 The Nepal Leprosy Trust (NLT) has a particular advantage in carrying out this urgent earthquake relief work. 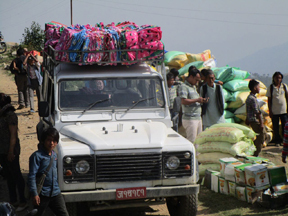 Being a Nepali NGO with a trusted reputation, NLT has been able to get access to remote difficult areas where government relief has not reached, and other agencies – even the big ones – are unable or unwilling to go. Relief materials: rice, lentils (dal), oil, salt, sugar, warm blankets, and quilts, Tarpaulins, Building materials (zinc sheets) for shelters. Photos below show the delivery of ‘zinc sheets’ (galvanised corrugated iron) to communities in Syaule VDC in Sindhupalchowk District in northern Nepal, not far from the Tibetan border. Each family receives 14 zinc sheets – enough for a total shelter – (very heavy – each sheet weighs 9.25 Kg). Try carrying that on your head. Extract and images from an update by Dr Graeme Clugston, Medical Director, NLT’s Lalgadh Leprosy Services Centre, 22nd August. 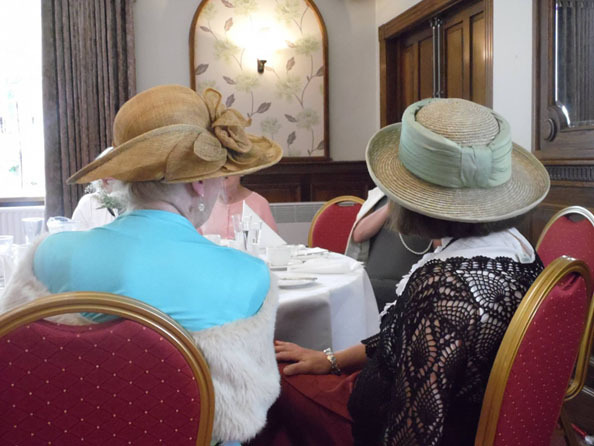 My friends and I love the chance to dress us, so Nepal Leprosy Trust’s (NLT’s) Vintage Afternoon Tea Party at the Celbridge Manor Hotel was the perfect opportunity. We thought we were doing well with our 1960s flowery outfits and hairbands but the Irish Historical Costumers stole the show in their hand-made Victorian costumes. 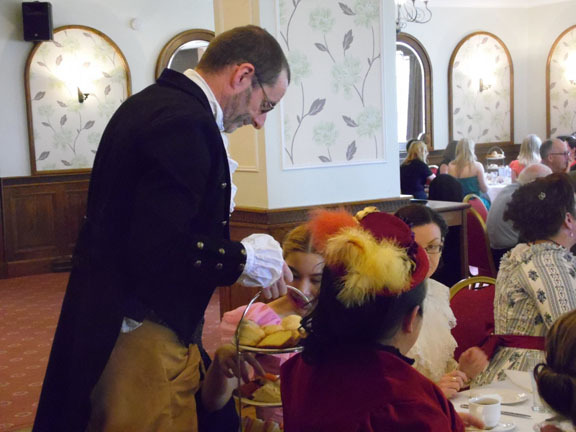 They wore bonnets, bodices, corsets and all. The tables were as colourful as the clothes. 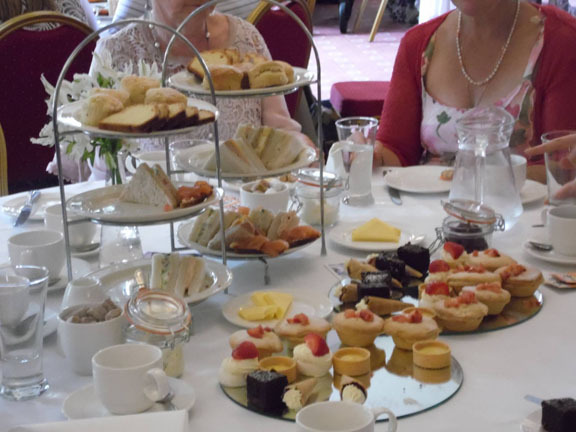 Éclairs, iced cakes, scones and biscuits stood on tiered stands and hotel staff, also in vintage dress, served endless cups of tea. We enjoyed ourselves so much, chatting to people about their costumes and walking in the beautiful hotel grounds. The Nepali Handicraft stand and raffle were a great way to raise interest in Nepal. Vera’s speech reminded us of the cause and encouraged people to support NLT, especially in the aftermath of the earthquakes. We all had a brilliant time and would gladly come to another fundraiser. By Emily Thomas, age 16. This is one of four districts (counties) where NLT is responsible for managing the government leprosy control programme. It is a remote area in the foothills of the Himalaya, 100km south of Mount Everest, lacking tarmac roads and infrastructure. Many people have still not received emergency relief materials due to remoteness. Dr Graeme Clugston, Medical Director of NLT’s Lalgadh Leprosy Centre reported that the area is in ‘total devastation – like it was hit by an atom bomb’. Sindhupalchowk Earthquake Relief Project . As you might have heard by now, another massive earthquake, of magnitude 6.8 magnitude (by a Nepal source) and 7.3 (US Geographical Survey), hit Nepal, with the epicenter in Namche Bazaar near Everest. About 100 people have died, and about 1,200 have been injured. All NLT staff and families are fine. Things had eventually gotten back to normal, but this has brought back the terror once again. Most of the houses which were cracked from the previous earthquakes, have collapsed, including some staff village houses. In KTM they were working in the office when the quake struck. They immediately rushed outside to the road and to the open fields in front of the office. Some of the NLT staff, including Maya, Juju, Yakub and Din, through their church, had gone to Malta, a village 45 kilometers south from NLT office, to distribute relief materials to the affected people there. The earthquake struck right in the middle of that. They shared that some houses collapsed right in front of them. Later the office was closed as everyone wanted to know about their families and houses. So far we haven’t heard about anyone injured. You can see Jakub on the lorry. Thank you very much for your prayers, and please do continue to pray for Nepal as all the people are very fearful. Pray for the peace of God to fill their hearts.